Friday September 10 Quite a frost last night but not to hurt grapes, but cold & cloudy most of day. I set about some (white) braiding had on hand soon after breakfast, which bound & finished off with another piece & took in to have Mrs Howe stitch in P.M. & took them down to May S_ in eve, I was in to see George of errand at dinner time & again with grapes for supper. 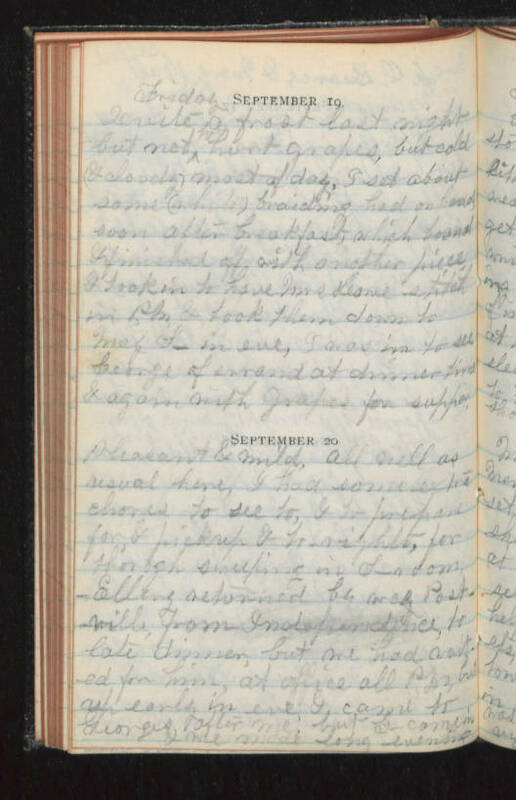 September 20 Pleasant & mile, all well as usual here, I had some extra chores to see to, & to prepare for, & pick up & to rights, for thorough sweeping in S_room. Ellery returned by way Postville from Independence, to late dinner, but we had waited for him, at office all P.M. but up early in eve, & came to Georges after me, but G_ came in & we made long evening.